Boil 100ml water with 1tsp powdered cinnamon for a few minutes. Let it cool completely. Mix 80ml of cinnamon water with the rest liquid ingredients in the mixer bowl. Dilute the baking soda in the orange juice and then pour it into the mixer bowl. Add the sugar and proceed stirring with the flat beater until homogenized. Mix all flours in a large bowl together with the orange gratings and add them to the mixer bowl. Work all the ingredients together for 2-3 minutes until the flour mix is fully absorbed. Transfer the mixture onto a non-stick tray lightly smeared with some olive oil and flour so as not to stick to the surface. Bake in a pre-heated oven at 170-1800 C degrees for 45-50 minutes. Pour the orange juice in a saucepan with the cardamom to acquire flavor. Bring to a boil. Remove the cardamom and add the agar-agar while stirring at the same time till it is fully diluted. Take off the stove and pour the mixture over a large tray in order to cool down. Cut the jelly into small cubes. Place a piece of pie on a shallow plate. Add a few pieces onto the pie and beside it. 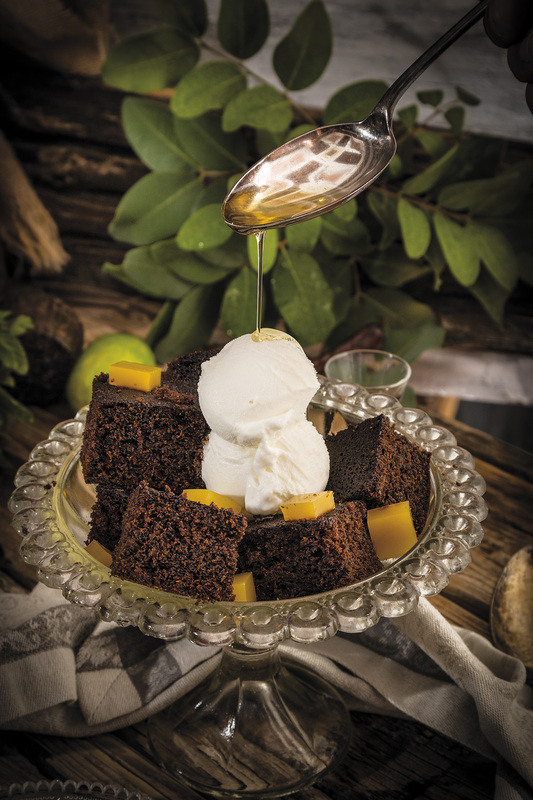 Top the cake with a scoop of vanilla ice-cream and lightly spray with vanilla-scented oil. An equally tasty option to vanilla ice-cream would be mastic-flavoured ice-cream. Mastic originates from the Greek island of Chios and is used in numerous other traditional recipes.